It’s come to my attention recently that I seem to be getting a lot of requests for recommendations and endorsements from people I’ve never worked with on LinkedIn lately. Whilst of course for the most part these are spammy requests that work on the logic that throw enough at it and something will stick, worryingly, some requests are coming from genuine business people. This is something I find quite bewildering, whilst of course we all want to gain recommendations, endorsements and glowing references, there’s no way cheating is necessary. It’s somewhat akin to buying likes, I suppose, or connecting with just anybody on the professional network, rather than people you can have a business relationship with. However, it can really harm a reputation in such a way that it’s just not worth it. I was reading a story recently about a chap who had gone for a job interview and been asked about someone they recommended on LinkedIn. It seems that whilst it was a person that he had worked with at the same company in the past, his experience of the guy certainly didn’t match that of the interviewing company. They’d had a negative experience when hiring the person for a contract and thus would then in turn question the interviewee’s judgement, who said in his review that the guy had an excellent work ethic. Unless you’ve worked with someone relatively closely, it’s impossible to say what their work ethic is like, especially following a change in industry. Recommending someone you don’t really know could then have far-reaching consequences affecting you and your business. Likewise, taking care with who you ask to recommend you could make the difference between getting a future position or not, it’s essentially a reference. If you have a reference from someone that you’ve never worked with, why might that be? Whilst I’m saying be careful with the people you recommend, not giving whilst constantly asking others is also a mistake. It’s also hardly worth asking if you never post any updates, contribute to groups and generally have a low LinkedIn profile. It’s a great idea to make your company a network of everyone who works both in the office and as a partner. That way, you’re going to be able to give and receive quality recommendations with a clear trail which immediately makes reputation more plausible. Endorse and recommend worthy colleagues and you will receive in turn. Don’t ever make the mistake of bitching about someone on the site though, that’s clearly unprofessional and networking suicide. According to Mashable, getting a job through social media often means you can bag a higher-paying position, so why take the chance? Add that to the fact that more and more recruiters are now checking out LinkedIn profiles and it seems to be something of a no brainer. It seems not though, the requests I’m getting are from SEO companies in India yes, but also from company directors, owners of reputable companies, people with a strong and impressive work history. Perhaps then, the answer is to include, as part of digital marketing advice, recommedations on what should and shouldn’t be carried out on LinkedIn in order to maintain credibility. 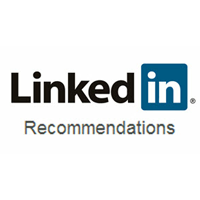 Looking for help with your LinkedIn marketing? Click here to learn more about our social media management services.